Mifflin County shortstop Brian Yetter, right, waits for the throw from home as Tallahassee’s Landon Shackelford steals second base in the top of the first inning. 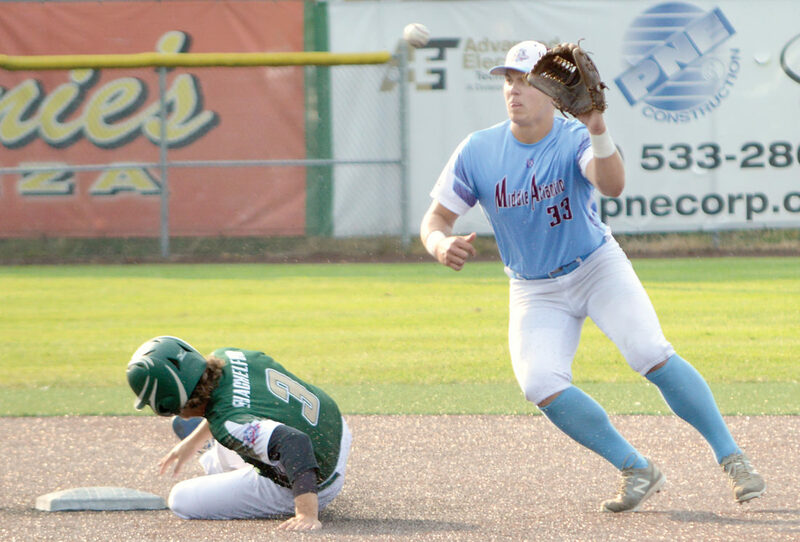 LONGVIEW, Wash. — Tallahassee, Fla., the Southeast Region champion, pushed across six runs in the last two innings to put end to Mifflin County’s dream of a second national championship here in the Babe Ruth 15-year-old World Series. 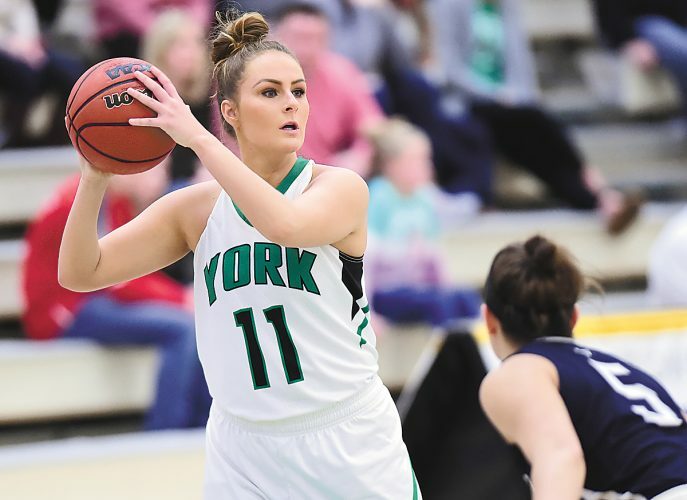 Mifflin County, representing the Mid-Atlantic Region, finished with a 20-2 record including district, state and regional titles along with a second-place finish in the national tournament. Mifflin County had beaten the Florida team, 3-2, in its opening game of this year’s national tournament. Mifflin County led 4-1 going into the sixth. Colby Bodtorf, the starter, got the first out of the sixth, but then allowed two singles. He came out and Connor Cherry came into relieve. 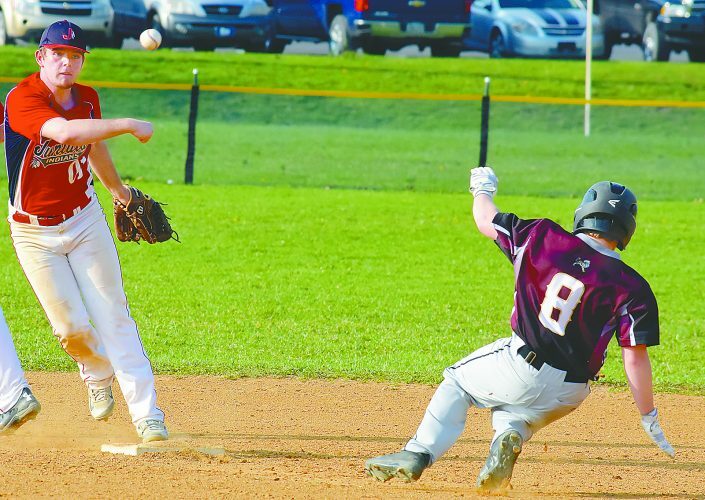 Cherry, who has been one of Mifflin County’s top relievers this summer — including in this tournament — ran into trouble as he walked two and then Will Brown came up with a two-run single. 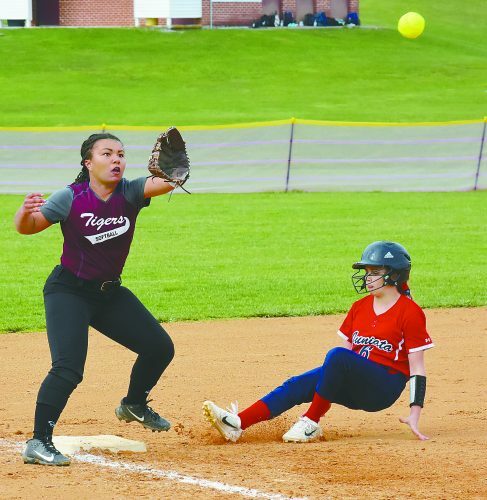 Tallahassee kept the pressure on Mifflin County and Cherry in the seventh. A hit batter opened the inning and then things kept going downhill. Two more singles, with one of those being a squeeze play, another hit batter and a walk, and the score was 6-4 in favor of the team from Florida. Finally, Brian Yetter was called in to stop the rally. He got a fly ball from Ethan Miller that scored a run and then struck out Brown for the final out. Bodtorf gave up three runs, struck out four, gave up six hits and walked two. A frustrated Yoder was taken out of the contest after a late-game discussion with the home plate umpire. Tallahassee scored a run in the first inning, but Mifflin County tied the game in the bottom of the first. Bodtorf walked and Yetter brought him home with a double. In the third, Mifflin County went ahead 4-1. Bodtorf led off the inning with a single and stole second. Yetter followed with a base hit and then Ethan Eichhorn smashed a double, scoring two runs. One out later, Eichhorn scored on a base hit from Brycen Hassinger. Mifflin County only had six hits as Bodtorf and Yetter each had two. Eichhorn and Hassinger had the other two singles. After Bodtorf had a two out single in the fourth inning, the Tallahasssee pitchers retired the last 10 Mifflin County hitters in a row to end the game. Although Mifflin County fell in the championship game, it came home with a basket full of honors. Named to the all World Series team were Casey Conner, first base; Yetter, second base; Bryce Dobson, third base; and Brycen Hassinger, outfield. Named to the All-Defensive team for the World Series were Cherry, outfield; Bodtorf, pitcher; and Eichhorn, utlity. Dobson won the slugging award and becomes the second Mifflin County player to achieve that honor in a Babe Ruth World Series. Conner batted his way to the honor in 2016 in the 13-year-old Babe Ruth World Series in Ottumwa, Iowa, which Mifflin County won. Dobson hit .471 in this series inlcuding a 4-for-4 effort against New Hampshire. Notes: Mifflin County now has a 14-7 record in the World Series and is tied withe Broomall-Newtown and West End (Williamsport) with 14 wins for second place in Pennsylvania. Levittown has the most wins with 16. … Mifflin County is just one of three leagues in Pennsylvania to put two teams into the national finals. The other two leagues are Broomall-Newtown and Levittown. 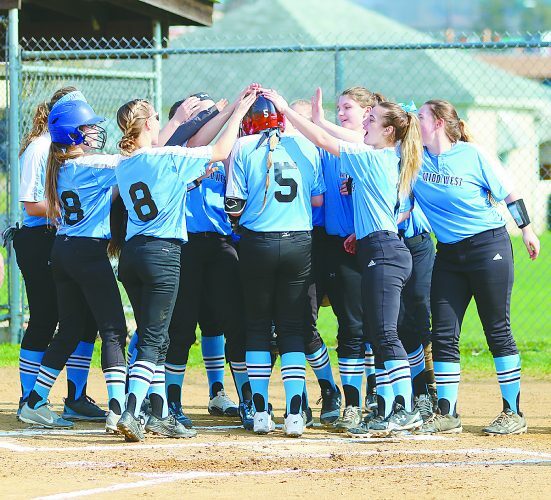 … The Mifflin County 15-year-olds finished with a 20-2 record in 2018, the most wins ever for a Mifflin County all-star team. The class of 2018 finished with a mark of 41-4, also a Mifflin County record for wins for one class. The four losses came in a state final (against West End in 2017); a World Series pool play game in 2016 in Iowa; a Mid-Atlantic regional game, also to West End, this year; and this year’s Babe Ruth World Series championship game.